Just a disclaimer here, I don't collect a lot of Play Arts Kai. I'm a huge Final Fantasy nerd but I find them to be fragile for such expensive figures and find myself wishing Square Enix would farm the license out to S.H. Figuarts or a similar 1/12 scale figure line. In fact, until this figure I don't think I've actually gotten a new Play Arts Kai product since the line underwent some serious changes a few years ago and I must say I was pleasantly surprised with this one! Cloud Strife was a gift for Christmas from one of my best friends (@GrimstarSC on twitter) so a big thanks (and secretly a big middle finger) to him for getting me back into this line. There is now a lot more on the way... I tried something a little different with the lighting on these pictures, hoping for a more dramatic look. Hopefully it goes over well, and I'd love to hear any and all feedback in the comments section or via the email address at the end of the review. "I'm not fit to help anyone. Not my family. Not my friends. Nobody..."
This particular version is based on his appearance in the film; Final Fantasy VII: Advent Children and also, due to the games use of his movie design, his appearance in Kingdom Hearts II. This figure has a very nice mix of soft goods (his half tunic/pant skirt thing) and paint to produce a stunningly, almost photo realistic product. He's got ratchet joints and a lot of good articulation to recreate many of his signature attacks and poses. The paint work is phenomenal and at times while editing these shots I had to do a double take to make sure I wasn't looking at a render from the film. "I think... I wanna be forgiven...More than anything." The ratchets are strong and will hold most positions without much trouble although holding his full combined sword outstretched is still out of the question without a support structure. 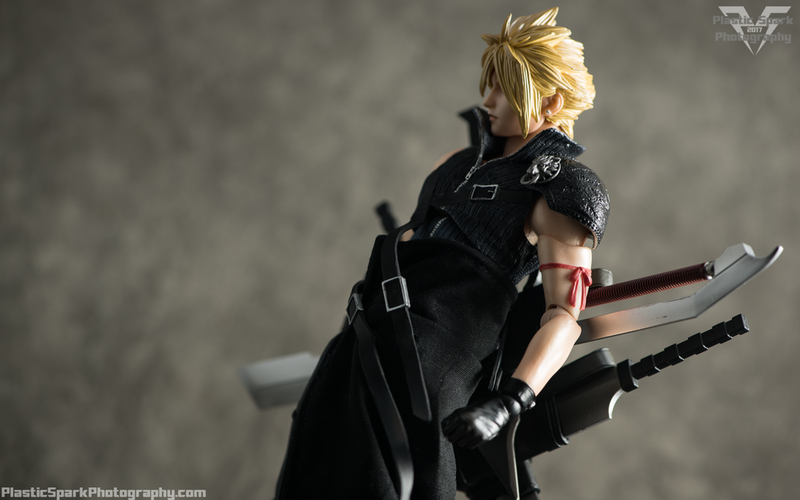 There were very few natural poses that I found myself struggling to pull off with Cloud. I was even able to replicate some of his more extreme limit break maneuvers. He could use a more robust ankle pivot but everything else has a great range. Admittedly for this gallery I was treating the figure with "Kid Gloves" due to previous tragedy suffered while manipulating PAK figures. 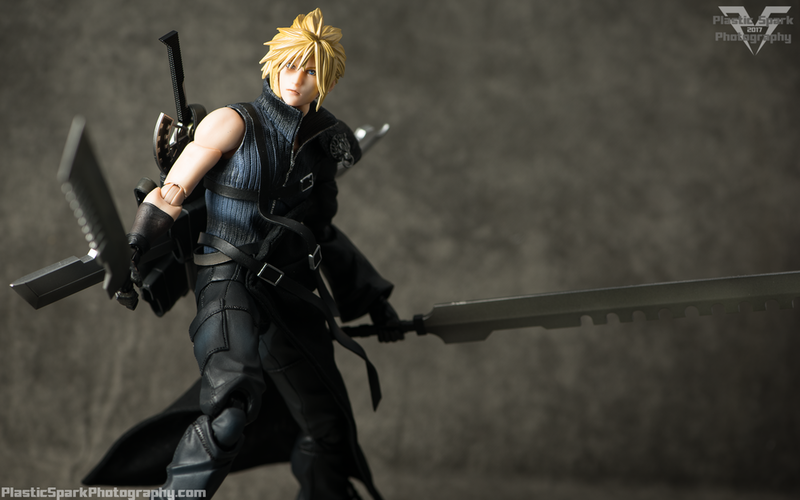 See the image in the gallery where I compare this figure to my now armless Dissidia Cloud for reference to that sad story. Also the new PAK figures are gigantic compared to the previous offerings. "I don't want you to get involved. I must pay for my own sins." I'm sure if I were a bit Braver (Har har har! I think I'm funny...) I could get some even more dynamic poses out of Cloud but I'm happy with what I was able to get and even more happy that he is still on my shelf in one piece. Be very careful manipulating some of the rotating joints as well, this is the second figure that I've gotten from PAK with a stuck bicep swivel that needs some shock oil or some other lubricant to un-stick. I still haven't done this to Cloud so some of his arm movement is limited. "I pity you. You just don't get it at all. There's not a thing I don't cherish!" The figure comes with a stand that can be used as a support for standing poses, or to pose cloud in an aerial attack pose however it is constructed with screws and nuts and the joints get incredibly loose if you adjust them more than once or twice requiring them to be tightened up constantly. I personally don't care for the stand at all and I will be looking for a suitable replacement. If you know of anything please let me know as he is a bit too big for Tamashii or Figma stands. 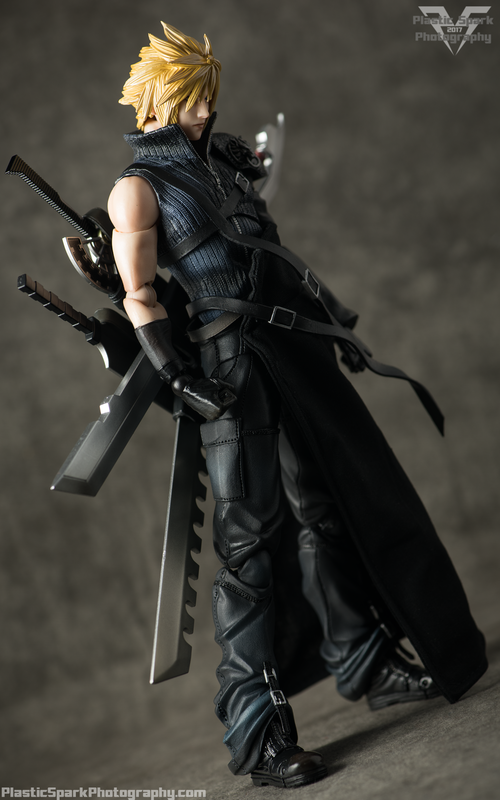 Cloud comes with a number of interchangeable hands, providing closed fists, weapon holding fists, and relaxed hands. The hands are made of a very stiff plastic so I would highly recommend using some hot water to assist in putting the sword handle into his hands the first few times. Personally I've just left his right hand permanently attached to the combined sword. He also comes with a replacement left arm so that he can be displayed with or without the sleeve. The naked arm has a pink ribbon tied around his bicep in reference to the ribbons worn by the main team members in Advent Children. "I feel lighter. Maybe I lost some weight. From all that dilly-dallying." Finally for accessories Cloud comes with an absolute treasure trove of weaponry. All 6 of his individual swords are recreated in stunning detail as well as a separate fully combined Fusion Sword. I think it would have been awesome if they had actually been able to make a combining Fusion Sword but given the materials I think you would end up with a lot of scratched paint on the blades from combination. I scratched a couple of mine just making this gallery! "I know; I'm not alone. 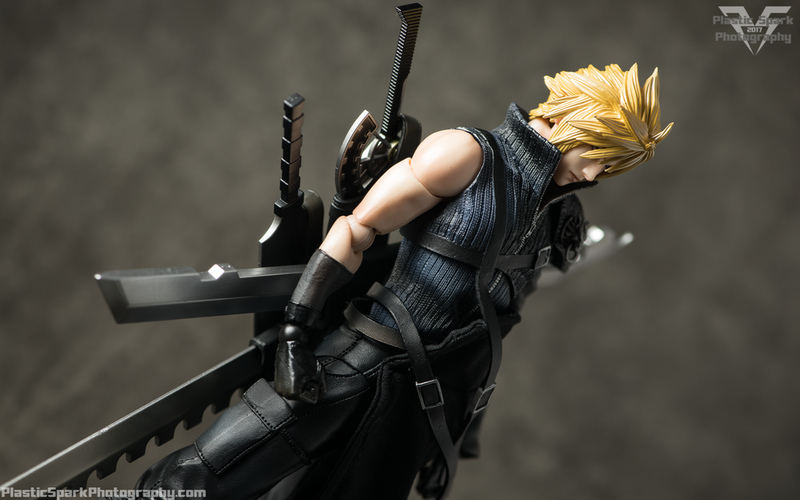 Not anymore..."
One of my favourite things about all the individual swords is that Cloud can actually holster all but 1 on his back in his multi layer scabbard (Would have been nice to get all 6 but now I'm being picky). 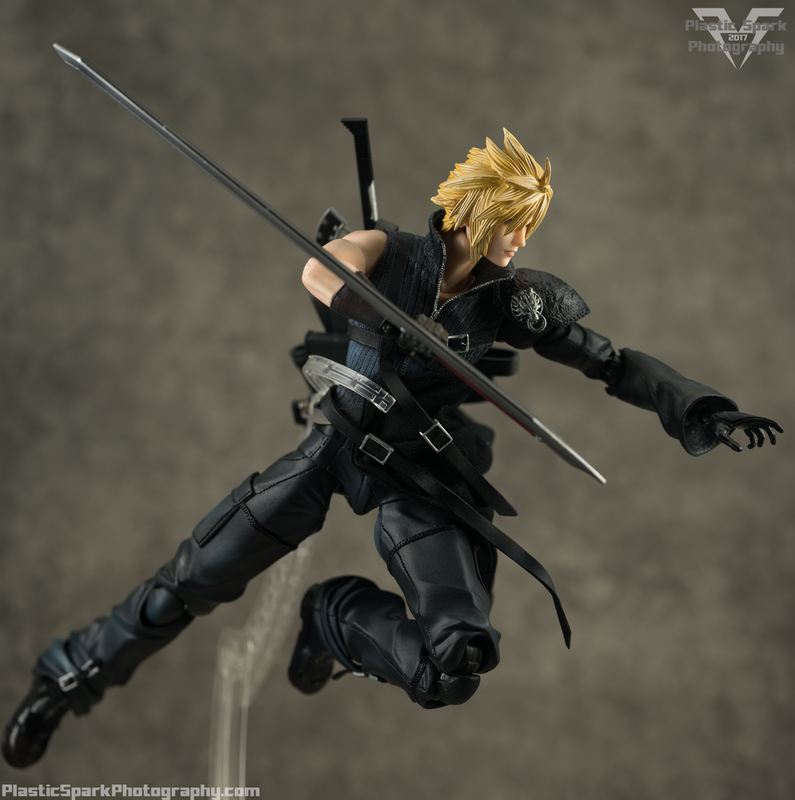 The scabbard is made of a flexible plastic that allows it to maneuver around Cloud's body for more complicated poses. The swords slide in blade first and you can arrange them pretty much any way you want, though I do recommend following the layout shown in the product photos to prevent some of the swords from banging into each other. "I just--- Listen, even if I go far away, I'll come back." For all my concern about the quality of Play Arts Kai in recent years, I have to admit I'm incredibly impressed with how Cloud turned out. The figure feels solid in hand and after spending some time with it I started to feel a lot more confident about posing him. I have no hesitation in recommending this figure to die hard Final Fantasy fans, though it is a bit of an expensive venture for the more casual toy collector. That's the price you pay for hand painted, high end Final Fantasy memorabilia I suppose. "That's right.. I am your living legacy." 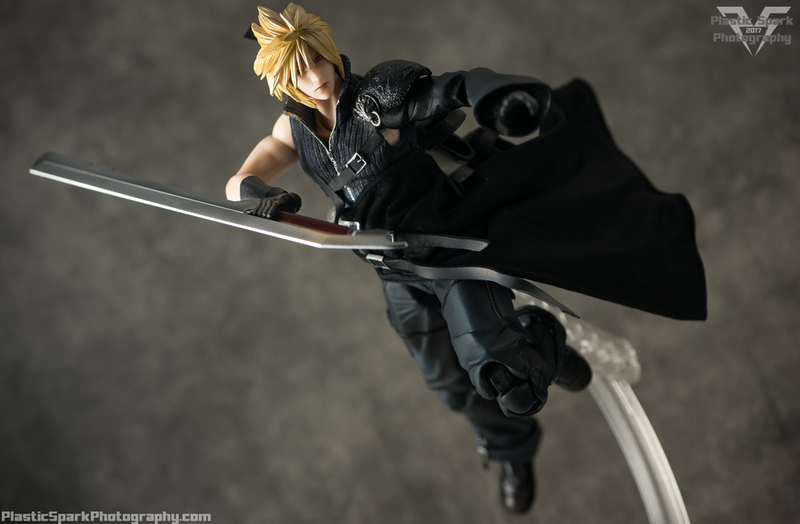 Thanks for checking out my review of Play Arts Kai Cloud Strife (Advent Children ver.)! As I previously mentioned, I tried experimenting with a different lighting style for this gallery and I hope it achieved the desired effect. Let me know what you think of the figure, review, and photos in the comments section below or email me at PlasticSparkPhotography@gmail.com!